NEWCASTLE United may find their resolve to keep hold of Cheick Tioté tested after it emerged that Russian Premier League side Lokomotiv Moscow are monitoring the midfielder’s availability. United are understood to have warded off interest in Tiote from several Premier League clubs last summer but after an inconsistent campaign – for both the Ivorian and the club – that position may have changed ahead of this close season. And Slaven Bilic’s Lokomotiv Moscow appear to be at the head of a queue of admirers that have watched Tioté since the turn of the year. Tioté has a long-term contract with United that extends until 2017 but his representatives are aware of Lokomotiv’s interest – and the determination of the Russian club to invest in improving on last season’s disappointing seventh-place finish. Much will be down to United, who must decide whether to adopt a similar policy towards their first-team players as they did last year, when Mike Ashley instructed all interested parties that there was a blanket £25million price tag on his stars. That was before a season that finished with United battling the drop, however, and does not take into account the fact that Ashley is prepared to shake things up this summer to improve results. United know there will be interest in their top stars, and already this close season they have seen Hatem Ben Arfa, Yohan Cabaye and Steven Taylor linked with rival clubs. Tioté, too, is a target and Ashley might be tempted if a bid of eight figures was forthcoming – as it would have been last summer if Newcastle had encouraged suitors that included Chelsea and Arsenal. while Moussa Sissoko, who played in the number ten role last season, could share Tioté’s defensive responsibilities with Gael Bigirimana, who is being prepped for a big season next year. United’s priority is to sign two strikers, but Braga striker Eder can be ruled out despite weekend reports linking him with a move to Newcastle. The Portugal striker is likely to be out for several more months with a cruciate ligament suffered in March, which would rule him out of making a switch to England. Newcastle want all of their targets to hit the ground running, and the club are unlikely to spend £16million on a player who might miss the start of the season. United do want someone to “dominate” the penalty area in the new season, however, after Alan Pardew identified set pieces as an area where the club must improve next year. 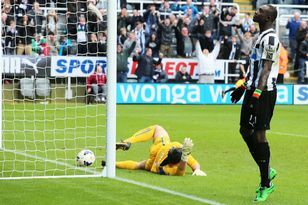 The club’s inability to create from dead balls last year – save for a couple of Cabaye free-kicks which were taken directly – was a major source of frustration. It led to the club considering another move for Andy Carroll, although senior club sources briefed that he is no longer a target last week. Pardew wants someone to join in the summer who can remedy that. “The big fall-down has been the centre-backs scoring goals from set-plays. We need to have more dominance in that area,” he said. “It’s all well and good saying that the set-play problem is down to tactics, delivery, whatever. Ultimately you need (players of) six-foot four (inches) to go and head it in, or at least make first contact. “We haven’t had that all year and it means all our wins have been one-goal wins, apart from Wigan and Southampton. What will be Derek Llambias' legacy at Newcastle United? THE irony is that Derek Llambias leaves Newcastle United at precisely the moment when he was needed the most. NEWCASTLE United are planning a major review of the season. Mark Douglas looks at the issues under the microscope.